LG's so-called "superphone", the Optimus G, is heading to Telstra on March 12, but the telco knows you can't wait that long. Pre-orders are now open for the new Android-powered smartphone, which will be available for AU$0 upfront on a $60 plan. This is the cheapest plan Telstra currently offers. This is a good price for a phone with this much tech under the hood. 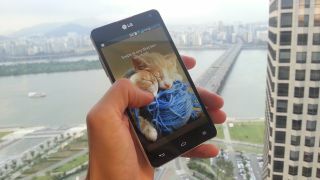 The Optimus G packs in a quad-core Qualcomm S4 Pro processor, 2GB RAM and 16GB storage under a 4.7-inch HD IPS screen. It supports 4G connections, and LG is claiming its 2100mAh battery is better than batteries of the same size from other manufacturers. The phone runs on Android Jelly Bean, and supports the new Miracast wireless media streaming protocol. If these are not good enough reasons to part with your cash before the release date, Tesltra and LG are also giving away a trip to Melbourne for the F1 worth $25,000. To enter you simply need to pre-order an Optimus G.
The Optimus G will face stiff competition when it finally lands in Australia, with the new HTC One, the Sony Xperia Z hitting stores and the same time, and the Samsung Galaxy S4 to be announced on March 14.